Do You Know The Values Your Clients Hold Dear? Early in an investor-advisor relationship, there is the “getting to know you’’ phase. While investors certainly want to know details about their advisor’s professional history, it's even more important that the advisors know the details of the investor’s background in order to serve them best. A financial history is obviously fair game during the introductory phase, but advisors would be wise to ask about other values investors care about. Did they grow up poor, middle-class or wealthy? Did they do well in school? What were they like when they bought their first home? These may seem like questions only a nosy advisor would ask, but that characterization is untrue. Details of an investor’s personal background can not only color an investor’s financial decisions, it allows the investor and the advisor to form a closer relationship. While to some the American Dream may seem like a symbol that has long passed, the factors that drove the citizens of the country from its beginning through the Industrial Revolution and the technology boom of the late 20th century remain standard to many affluent investors. An advisor working with those investors would be wise to know just how much the American Dream shaped the investment history and habits of the investors they are working with. Spectrem wanted to know if those American Dream components still resonate with investors. In recent research, investors were asked to rate the value of statements related to home ownership, saving money, jobs and education on a 0-to-100 scale. The statements received strong support from all investors, although there are variations based on wealth segment. Advisors can ask investors what it means to them to own their own home. If their ownership currently includes a mortgage, is that something they would like to see paid off? Are they not bound by location in terms of home ownership? Do they see upsizing or downsizing in their future? The statement that received the highest positive response from Millionaires stated “Getting a college education is very important”. On a 0-to-100 scale, where “0’’ indicated not important and “100’’ indicated very important, that statement averaged 85.65 among Millionaires. Ultra High Net Worth investors scored even higher, at 88.24. Whether a college education leads to Millionaire status is not a certainty, but 83 percent of Millionaires credited education as a factor in their wealth creation. Advisors, note that Millennial Millionaires rated the value of their college education somewhat lower (77.31) and in fact rated all the core belief statements lower than other age groups. What is driving Millennial investors if it is not one of the touchstones of the American Dream? While advisors can ask about the value of the education the investor received, they would be wise to ask about the value of the educational plans investors have for their children and grandchildren. Investment decisions will certainly play a role in those plans. The statement receiving a similar level of support in the study regardless of wealth states “a dedicated and regular savings program is something I consider very important”. Among Millionaires, that statement rated 84.14 on average. Among UHNW investors, that statement rated 85.52. 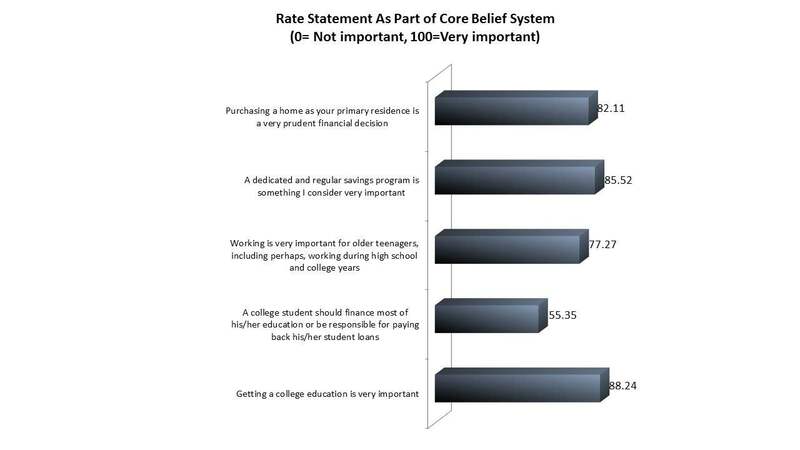 Millennials again rated this statement lower, 71.59, the farthest off from the average score of any of the core belief statements. Obviously, advisors need to know where their investors stand in regard to a regular savings program. Questions about the money they save versus the money they invest will determine much about the program you set up for younger investors. The rating dropped below 80 on average in regards to the statement “Working is very important for older teens, including perhaps working during high school and college years”. That statement got a rating of 78.99 overall, but was slightly lower at 77.27 among UHNW investors. It may seem “old hat’’ to give consideration to the historic staples of the American Dream, but people still abide by them and are driven by the desire to acquire the basics of a good education, a good home and a thriving savings account. Advisors should know where their investors stand in regard to those propositions, and invest accordingly. When dealing with investors with children or grandchildren, the thrust can be about providing for their education or a financial base for their progeny as part of their investment plan. While the “getting to know you” part of the investor-advisor relationship is standard, it’s a vital part of forming a long-term partnership. Investors will let their advisor know what they want to share, and advisors must not only listen out of politeness but also as a way to make investments match the desires of their investors.